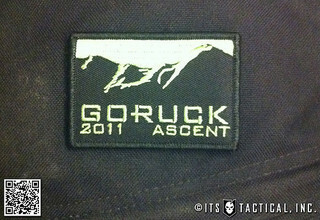 One of the hardest things about the GORUCK Ascent for us has been figuring out how exactly to describe it. 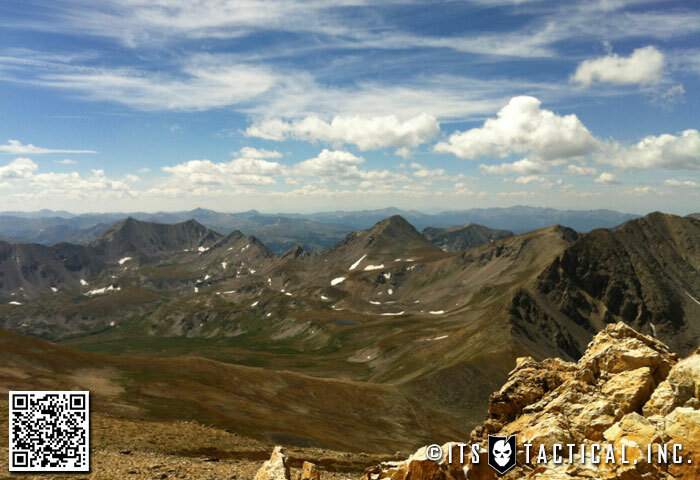 It was so much more than simply getting the opportunity to climb multiple 14,000 foot peaks and even more than a field test for the GORUCK GR2 pack. Hand the GORUCK GR2 to an avid backpacker or mountaineer and they’ll most likely begin pointing out what makes their pack better. It’s lighter, it has a waist belt, it’s colorful… you get the idea. 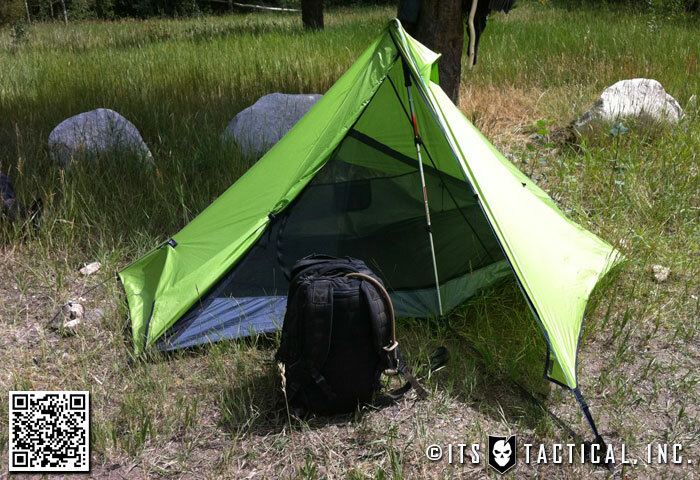 But we assure you, the GR2 was in no way a simple bag. It’s not only capable of summiting 14’ers, but getting you to and from every campsite and trail head in between. Throughout this article you’ll be reading both of our (Bryan’s and Mike’s) experiences during the Ascent and our journey along the way. 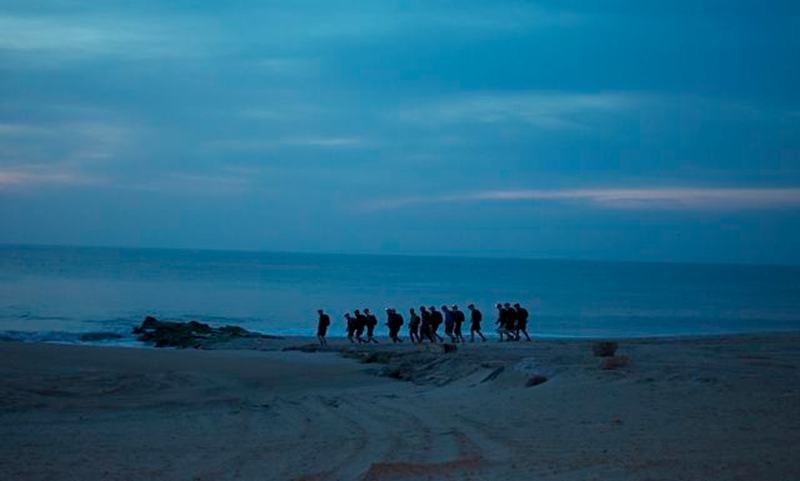 The GORUCK Ascent wasn’t just an event that forged friendships, took us out of comfort zone and forced us to overcome adversity daily, but introduced us to parts of ourselves that we never knew existed. 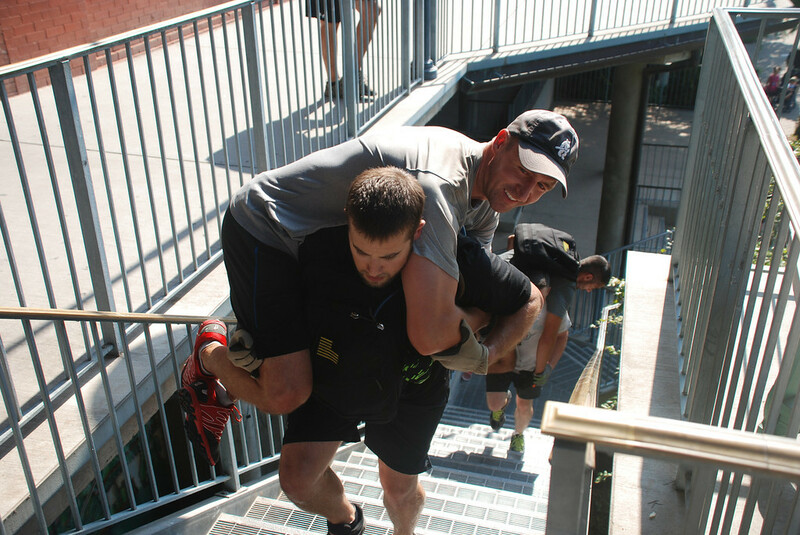 While the Ascent wasn’t billed as a GORUCK Challenge, what we came away with is truly what a “challenge” is all about. Personal growth. 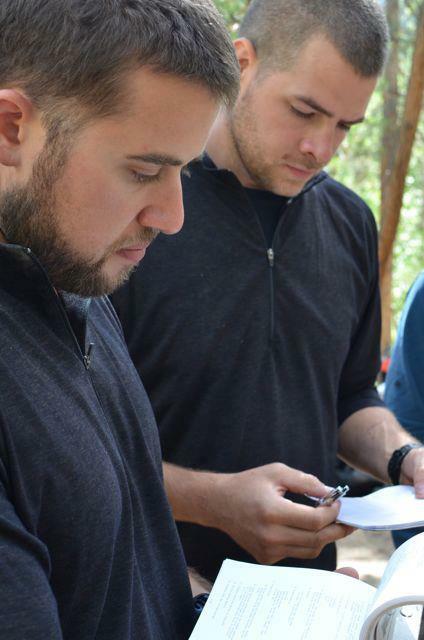 In the months leading up to the GORUCK Ascent we not only prepared physically, but with the help of some awesome vendors, we meticulously put together our packing lists. Everything we would need for the 100+ hours would have to come with us. As you might remember in the articles linked above, we got very detailed with our lists and had our GR2s down to 28-31 lbs. A huge lesson learned is that you can do without more than you ever thought you could. That was a big take home lesson of the entire adventure; doing more with less. This wasn’t only a lesson for the week, but something that can be applied to our busy, hectic and consumer driven lives. It’s how most of us are and we’re both as guilty as the next person. 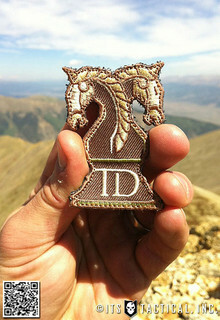 Having never climbed a mountain of any significant altitude, being as prepared as possible was paramount. We did just about everything we could do short of taking prescription medicine. About two weeks prior to the start and every day during, we were taking Ginkgo Biloba as a way to lessen a chance of Acute Mountain Sickness (AMS). 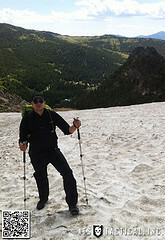 We were also the first two to show up three days before the Ascent and spent time hiking around the local land in Nederland, CO, which served as the Ascent HQ (8,228 ft. elevation) and climbing Saint Mary’s Glacier (12,136 ft. elevation) trying to do everything we could to acclimatize. We both continuously remarked how beautiful the small town of Nederland was and how clean the air was compared to the cities we had come from. When we arrived at HQ on Monday, we were greeted by GORUCK’s CMO, Sarah, who said she was literally just reading our packing list article on ITS! We were able to get some time to chat with the Cadre and they let us know that the Ascent was not a Challenge in the typical sense. We were told that the Ascent is more of a reunion than anything else. 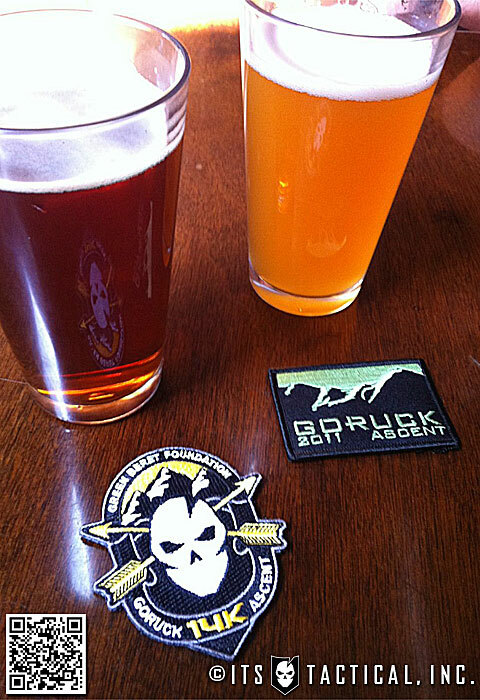 A way for members of the GORUCK Tough community to come together and do something great while relaxing and hanging out at the same time. Little did we know just what their definition of relaxing was! 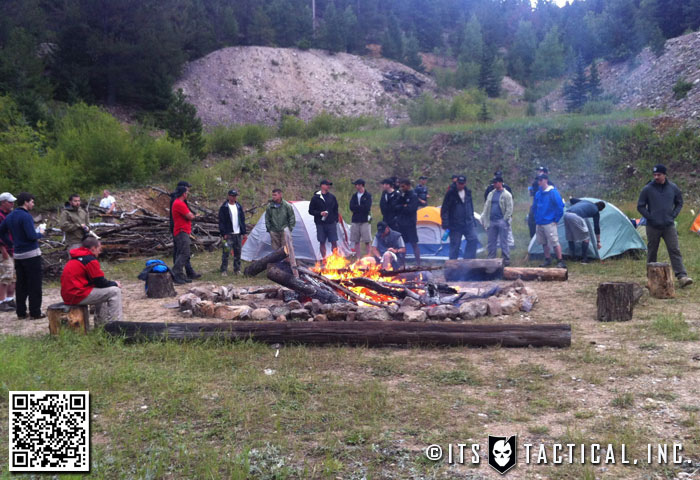 Prior to the official kickoff of the Ascent on Wednesday evening, those that were there prepped the camp, dug a fire pit and searched for as much firewood as possible. This was important because once we started a fire, it had to be maintained and we were told that the next time we’d be in camp, we’d be exhausted and it wouldn’t be fun to look for firewood then. Boy were they right about that! Wednesday was the official start of volunteer day, designed to get us working and aid in the acclimatization process. 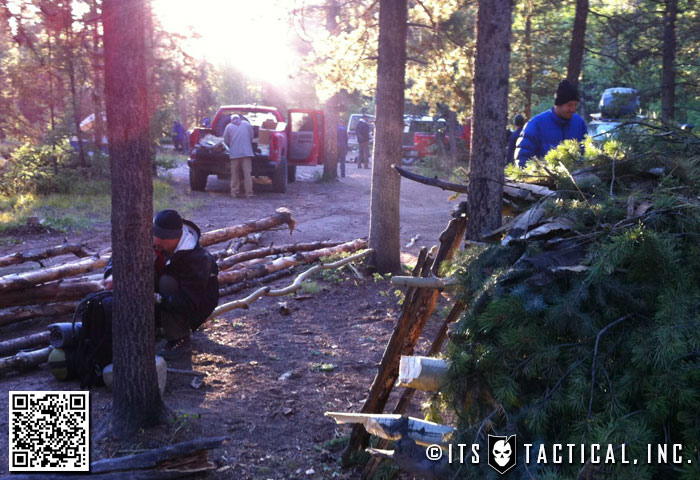 Those of us who had already arrived headed out to a local trail early that morning to help the U.S. Forest Service build up a newer trail to handle the rigors of mountain bike use. We learned so much that day about trail building that we both take for granted when riding mountain bike trails, as building them was no easy task. Using Pulaski and McCloud tools we positioned rocks, graded and did work! The remainder of the day, after returning from our volunteer project, was spent completing micro missions. One such mission near and dear to our hearts at ITS was untangling 1,000 feet of paracord that had come off the spool. Any of you out there that understand what a nightmare this is can surely empathize. 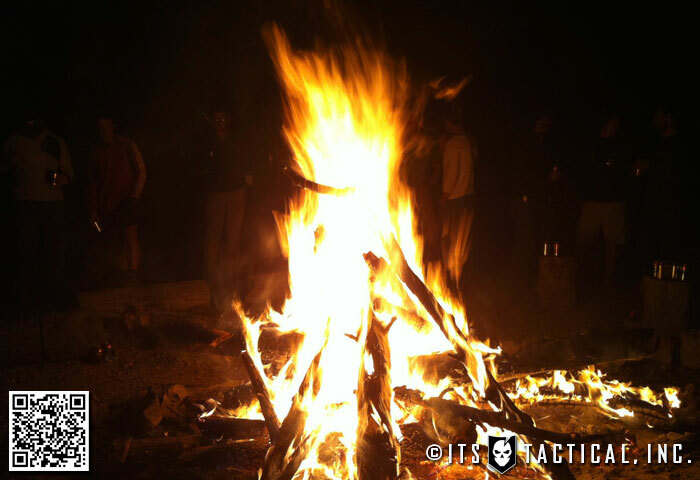 That evening was spent concentrating on the essentials (beer, food and fire) and kicking off the Ascent. 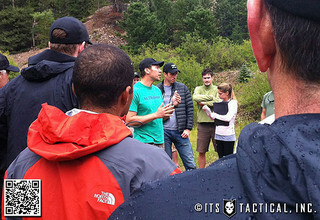 After introductions of the Cadre and GORUCK staff, we received our warning order and intel for the next day. 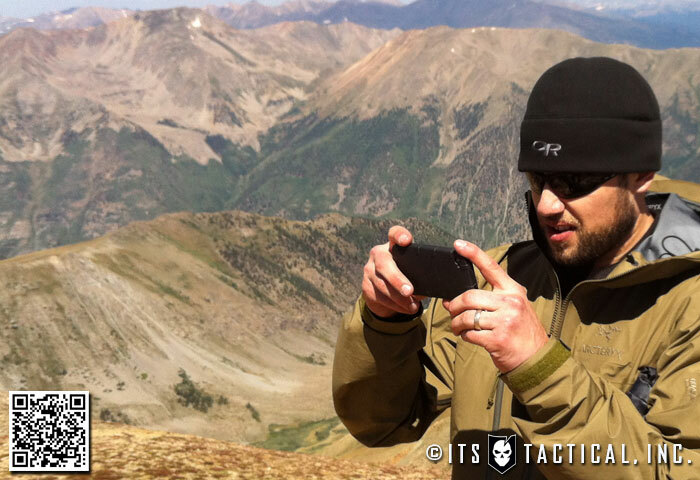 Dividing into two teams, we met with the Cadre and were given the coordinates of the peaks we were to attack. 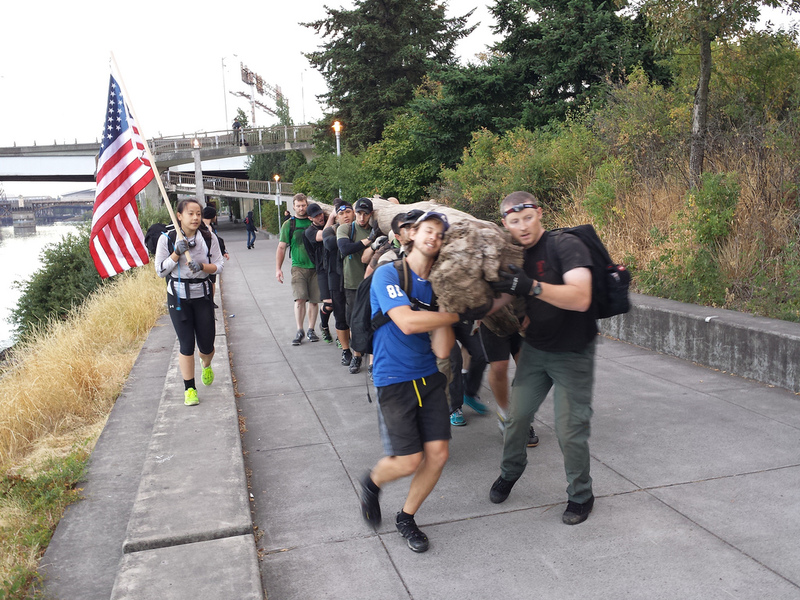 Another little bit of intel they sprang on us was the ruck weight limit of 23 pounds. No one seemed to come there with a ruck that light, so we were all scrambling to shed any extra weight. If it wasn’t essential to survival, it wasn’t coming along. Simple as that. We even decided it was best to leave the Nemo Gogo LE tent and share the one man Nemo Meta 1P to save weight and bring more food. Once we got everything dialed in and squared away, we tried to catch some z’s before our 0145 wake up. There was a bus coming to take us to our first objective and luckily the ride was around two and a half hours long so we all got a chance to rest some more. We rolled into the Collegiate Peaks trail head near Leadville, CO with darkness still obscuring the 14’er that awaited us in the distance. The first team departed a bit ahead of us to hit Mt. Missouri (14,067) as our team anxiously went through some stretching, led by Alex, one of the two Cadre that would be with our group. Coming from damn near sea level, the two of us and what seemed to be most of the group, were dragging through the steep switchbacks that make up the first mile that cut through a forest of spruce and aspens. Our lead cadre Alex, who was appropriately nicknamed billy goat, set a quick pace and would systematically build in brief rest stops. During these he would literally sprint from the front to the back of our 20+ group ensuring everyone was good to go. He could have ran up Mt. Belford and summited without appearing out of breath. With the better part of a 4,660 ft. elevation gain ahead of us, we reached the trail junction in Missouri Gulch as the day was fully upon us. One of the Cadre, Rob, had arrived early to the Gulch and we were told that we could leave some extra weight with him if we wanted to, as he would be there at the aptly named “casualty collection point” to wait with anyone who had to descend. 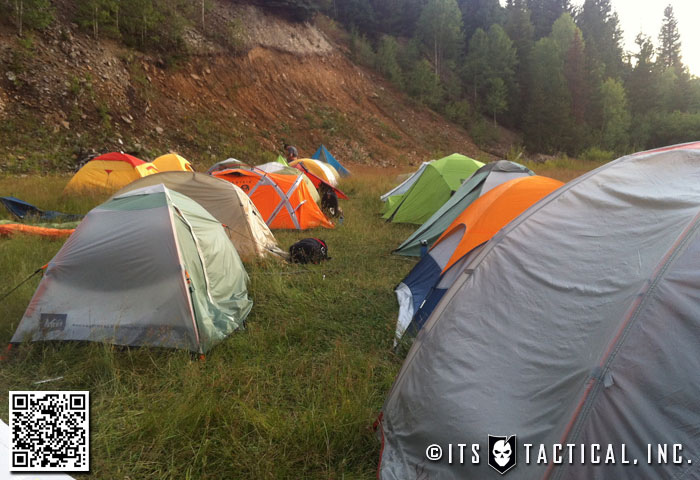 Sleeping bags and pads could stay behind but it was a good idea to keep a tent in case the weather got severe. Staring up at the ominous switchbacks that awaited us on the northwest ridge of Mt. Belford was intimidating and looked to be too steep to climb, but as we continued to ascend that feeling went away and we chalked it up to the perspective we were seeing from below. The weather that day was interesting to say the least and despite the sun shining brightly, we were alternating between our base layer shirts to full on hard shells with the hood pulled tightly to deal with the wind. Bryan: As we continued our ascent with the false summit just in view from the flat spot where we turned left (13,900 ft.), AMS headache symptoms hit me hard. Despite taking Aspirin, they never subsided, only got worse. By the time we reached the summit I could feel my head pounding in my throat. I remember that I kept telling myself “if it gets any worse I’m turning around.” I’m not sure if I even could tell if it was getting worse, but I never turned back. Not even our descent eased up on the headaches. It wasn’t until we were back near the trail head that they started to subside. 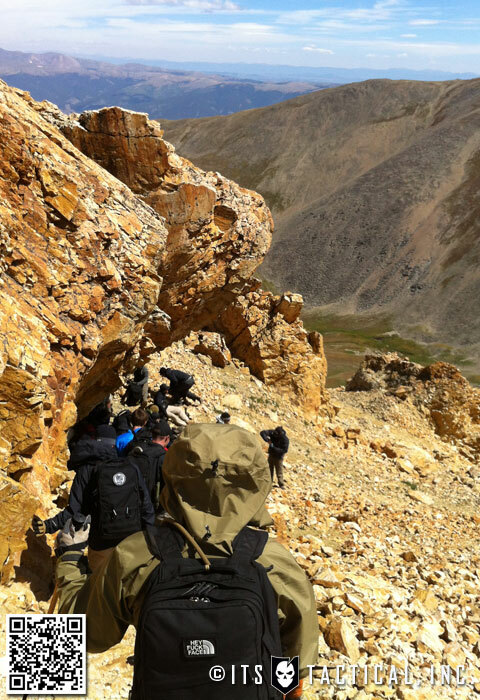 Mike: Right as we were about to summit Mount Belford, maybe just 300 vertical feet shy, I started to get a headache. We were so close that I decided to push through, especially because it was just starting and wasn’t too bad. After our summit photos I took some Ibuprofen and hoped for the best. While planning our descent and some other missions it started to intensify. All I could focus on was getting down and I wasn’t much help to the rest of the team. I started to get very quiet and my steps were getting a little sloppy. All I wanted to do was get down and I felt as if I were taking forever. It was like walking down an escalator that was coming up. 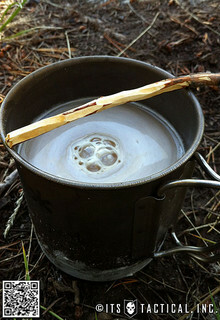 Once we hit the tree line I started to feel better and getting some freshly filtered water from a stream livened me up. Everyone has a point at which the effects of altitude hit them, not necessarily in AMS symptoms, but the point at which you start to walk slower and your pace is labored. 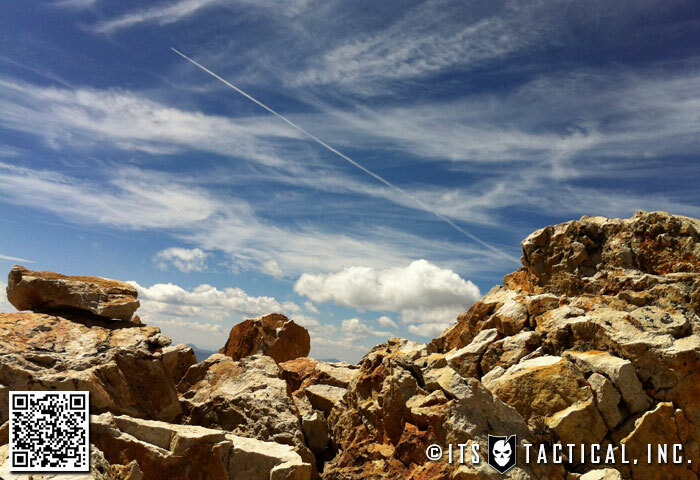 Ours was somewhere around 13,900 ft., surprisingly when both of our AMS symptoms hit hard. Despite the AMS, the summit was beautiful. There’s something about being past 14,000 ft. and looking down on the world. Everything seems to stand still as you marvel at God’s creation and realize just how small you are, surrounded by giants. Bad weather rolls in most afternoons on 14’ers and a general rule is to start your descent by 1300. 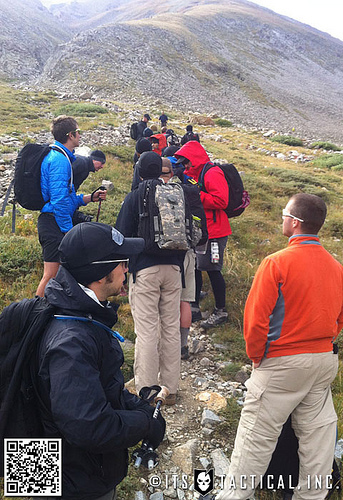 While reveling in our ascent accomplishment, Dan our 2nd Cadre and an active duty Green Beret, informed us that there were hidden caches that the cadre had planted along our descent and it would be to our advantage to obtain them using the provided GPS coordinates. 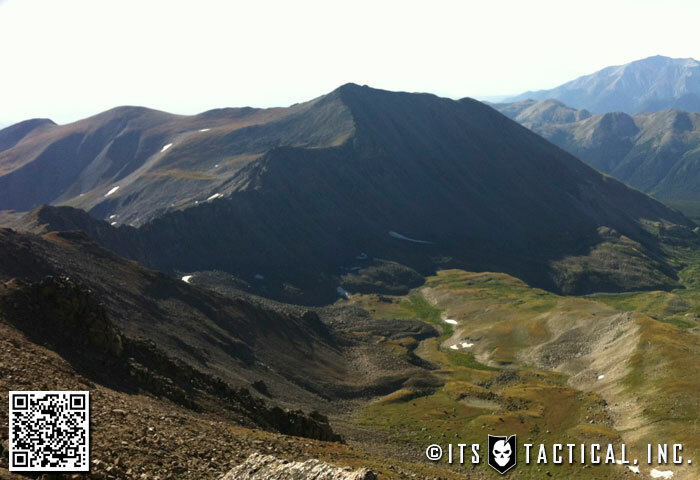 We were able to locate three caches as we descended what seemed to be double the distance we’d just covered ascending. 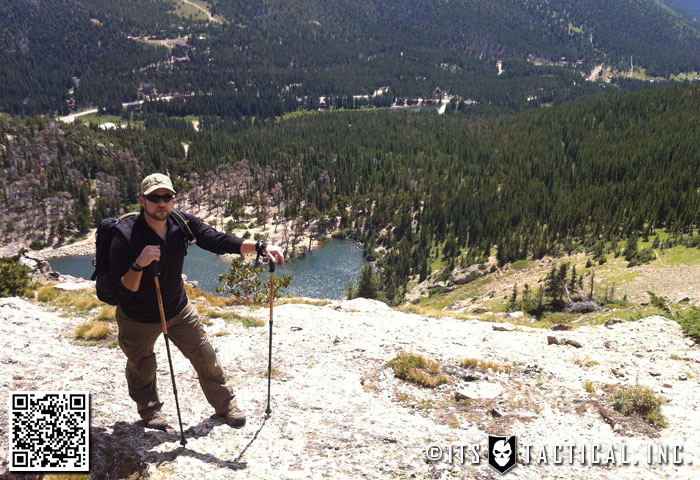 We both had trekking poles, which proved to be tremendously valuable both on the ascent and especially the descent. Dr. G. Neureuther published a study in 1981 which proved that the use of “ski poles” while walking, reduced the pressure strain on the opposite leg by 20%. 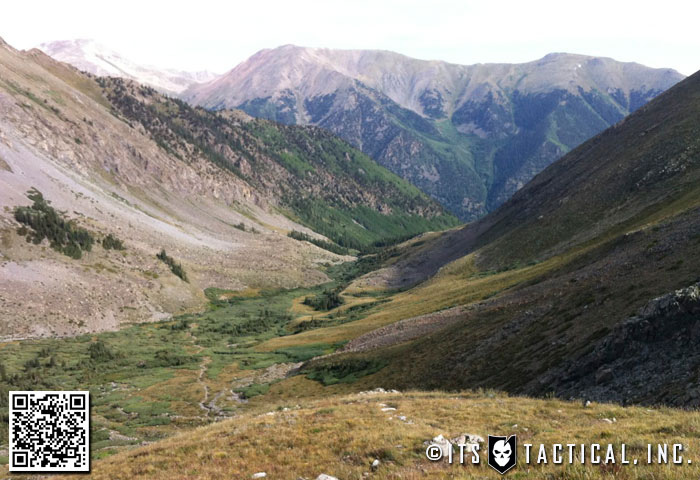 As we reached the Missouri Gulch trail junction, we met back up with the advance team that had left that morning to hit Mt. 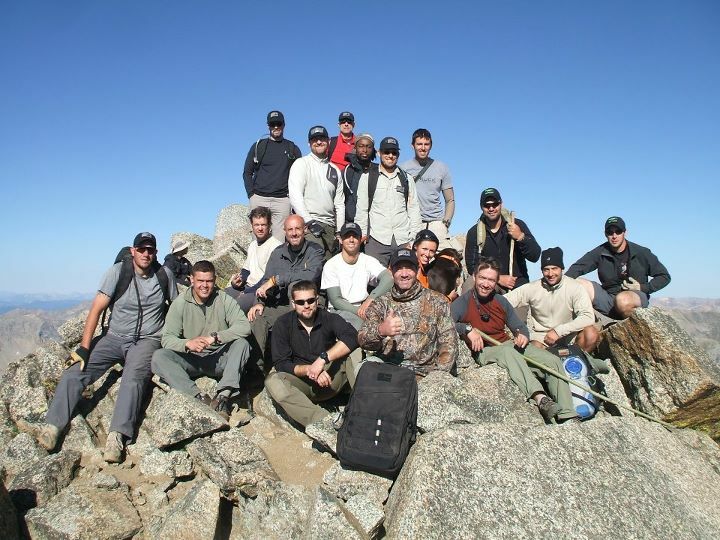 Missouri and both teams collected their cached belongings and completed the descent. It was a tremendous accomplishment for both teams and a long 11 hour journey by the time we made it back to our base camp that we’d call home for the next two evenings. 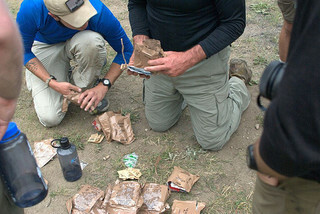 Hungry, our team was rewarded with a big bag of rice and two boxes of LRP Rations for the caches we found (Just like MRE’s, but with more calories). 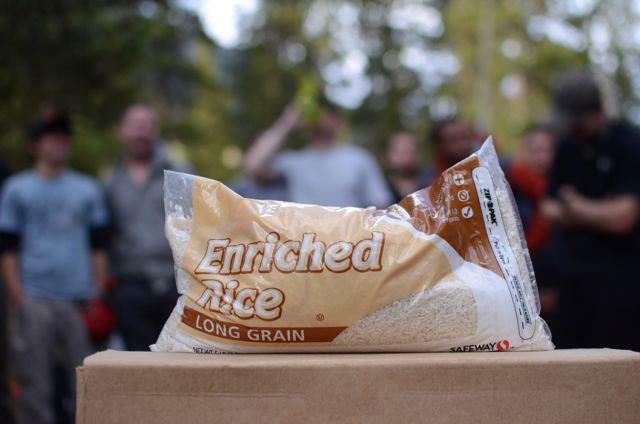 The other team didn’t locate any caches and were given nothing but a bag of rice to eat. No one had had any lunch and not much of a breakfast at this point either. Everyone was extremely exhausted and tensions were high as we tried to figure out how to split up the meals. We already burned through most of our 1-2 pounds of ‘lickies and chewies’ on that first day climb and had to think of fuel for tomorrow. In the end, we decided that we were all one big team and we had to think of ourselves as a team no matter what. We shared the MRE’s and actually had extra which some ate for breakfast. This was the second wrench that had been thrown at us, after the packing weight debacle the previous evening. This began our food deprivation and essentially being provided food only at dinner, which was at most an MRE split between two or more people. Those smart enough to have rationed their lickies and chewies had something to put in their stomachs throughout the day. We both rationed ours well and had some the entire four days away from HQ, even if it did only consist of Clif Bars split into eights or a few almonds as a time. Talking to the lead Cadre, Brian, a former Green Beret and 18D (Medical), we were both officially diagnosed with Acute Mountain Sickness (AMS) based on our symptoms on the mountain. Everyone acclimatizes differently and there’s no magic formula in which your fitness level gives you a leg up. It affects everyone differently no matter your body type and even if it hasn’t affected you previously, you’re not immune to it in the future. While good health isn’t a benefit to not getting AMS, bad health is certainly a risk factor. After dinner we were wiped out and went to bed before 2200, but we were up at 0445 to tear down the camp as the summit teams left. 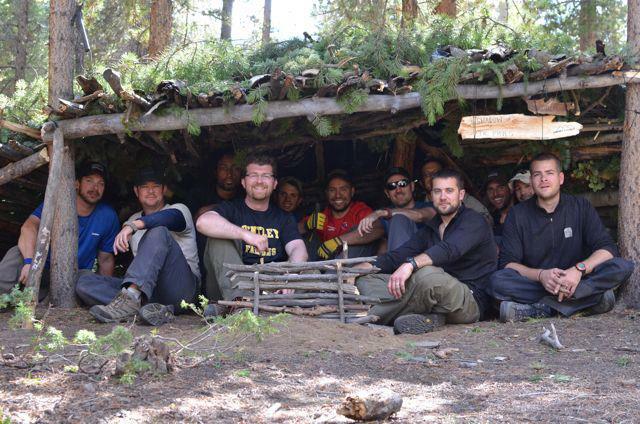 Those that stayed behind learned various field craft skills from Dan, specifically shelters and fire building. We ended up building a fairly large shelter which even stood up to Dan’s test of dumping 5 gallons of water on it. 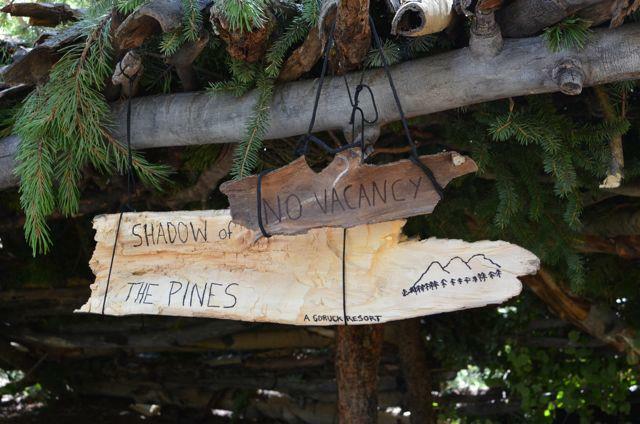 We were all surprised at how the GORUCK Resort, “Shadow of the Pines,” held up. The groups that summited came back with tales of electric charges and hail storms which oddly enough made us jealous that we missed out. It’s discouraging to know that we did everything we could to stave off altitude sickness, short of taking prescription medicine and getting to Colorado even earlier. That night we discussed plans for the next two days. 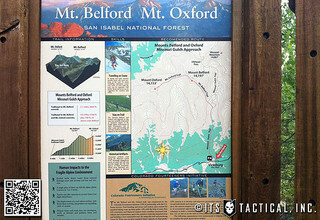 We were to move South the next day and establish a new base camp at North Fork that would serve as a staging area for a team to attack Mt. Harvard and Mt. Columbia in a single shot. They would be the first team to be transported, as they would have to leave in the early afternoon to ensure they had time to hike in to the base of Mt. Harvard to set up camp for an early morning summit. 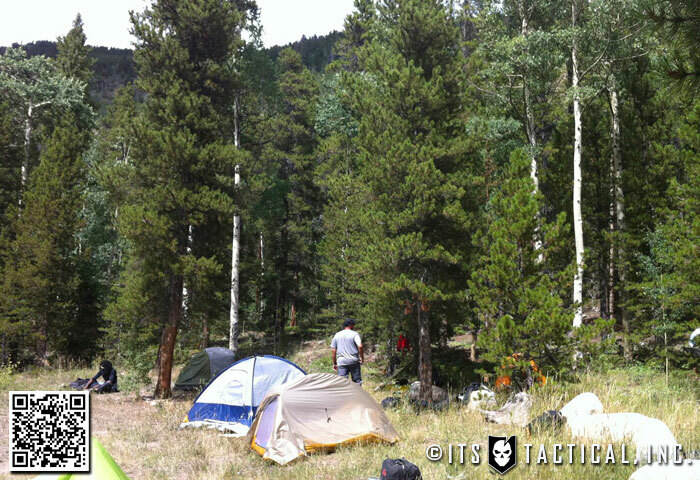 A second team would also be leaving later in the afternoon to hike out and spend the night near the base of Mt. Yale, they too would hit an early morning summit. 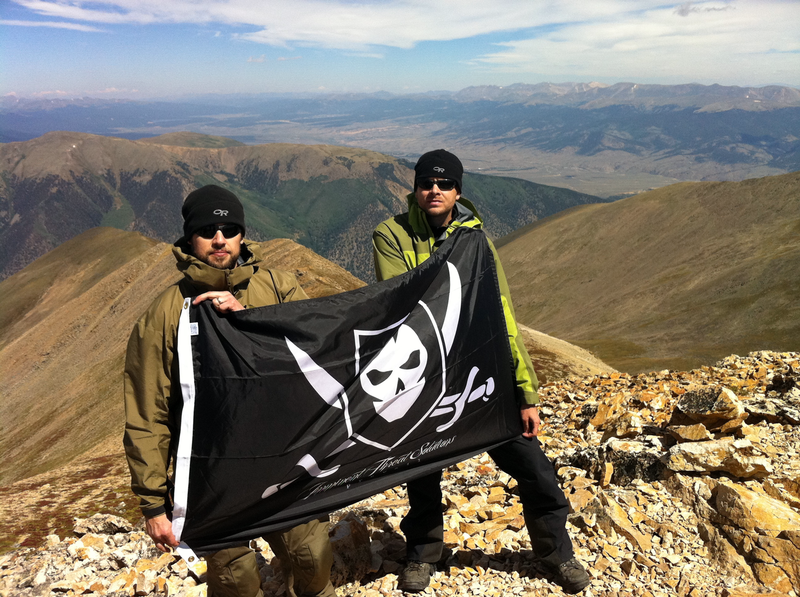 A third team, which Bryan was a part of, would leave at 0200 for a direct hike from base camp to summit Mt. Harvard. 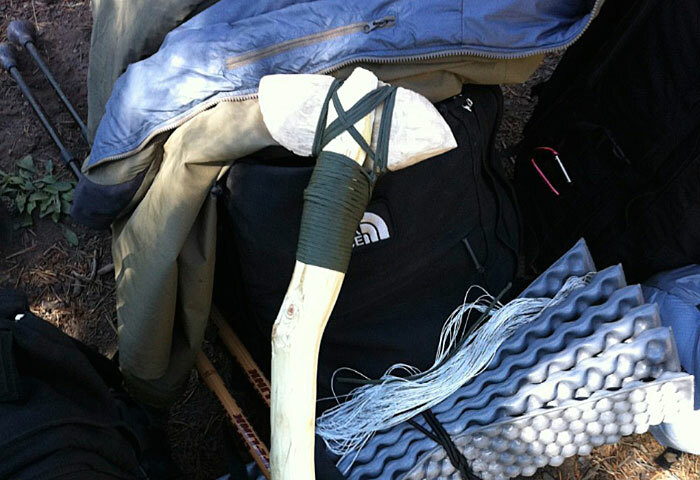 The following morning we packed up camp and while we awaited transportation to the next campsite, we were told that we all needed to make a spear, club or hatchet. We planned to bring them while we went off looking for wild game that night. 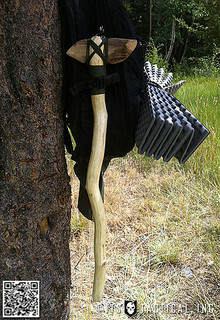 We both worked together to fashion a battle axe out of a long piece of fallen Aspen. By splitting the top of the branch, we inserted a carved blade section and tightly wrapped it with gutted paracord. It’s amazing what you can come up with given time and opportunity and the project renewed our confidence of being able to build field expedient weapons! When we both arrived at our new base camp, the Harvard/Columbia team had already departed and the Yale team was busy getting their gear together to depart. Those attacking Harvard directly in the early, early morning had some down time to prepare the camp. There was a beautiful flowing stream right near the camp that was fed by the melting snow from the mountains. 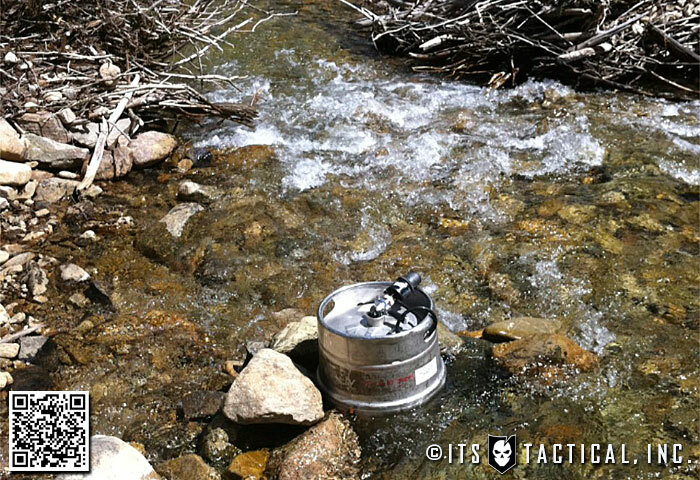 It was extremely cold water and we quickly decided to build a dam to keep our keg and beers cold. We had a keg? Yep, BFF (beer, food and fire). A few of us also used the stream as an opportunity to join the polar bear club and rinse off. We also realized that we had the possibility to catch some small fish and a few people quickly set to work building a fish net. While just hanging out by the stream exploring, Mike was able to catch a small seven inch brook trout with his bare hands. It took a good bit of scrambling for him to finally grab and hold onto it, but after gutting it and cooking over the fire, we all had a meager but nice snack. 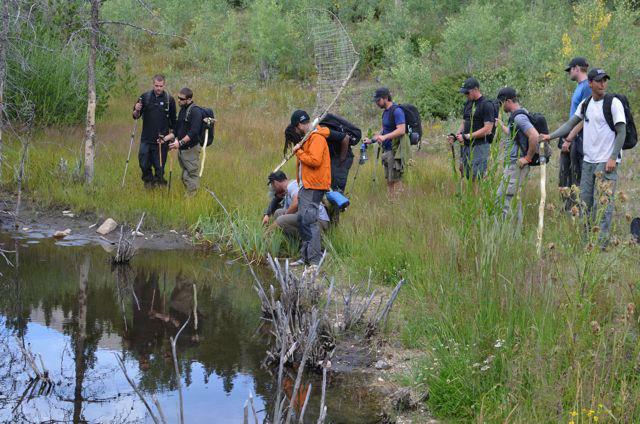 Led by Lou, our cadre and active duty Green Beret, we took an evening hike following some game trails and learned how to set snares for everything from deer to beavers. We also collected a few cat tail roots to make a stew later. 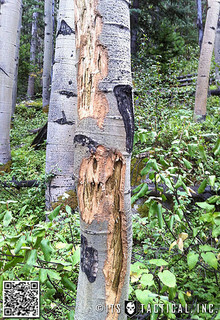 On the hike we even found evidence of a bear that marked his territory by clawing a tree. It was interesting to think of us traveling the same path of a bear because neither of us see those where we’re from. Additionally on this hike, a fellow Ascenter managed to catch another fish. The ‘fisherwoman,’ Holly, then strung it up with some paracord and carried it around like a necklace until we returned to camp. As those that would leave early for Harvard the next morning prepared, we all had a great time watching Ranger TV (fire) and telling stories. Unfortunately for you, stories told on the mountain, stay on the mountain! Bryan: The 0200 wake up call came quick and I’m always amazed at how quickly I can be up and ready when I’m away from the comforts of my bed. 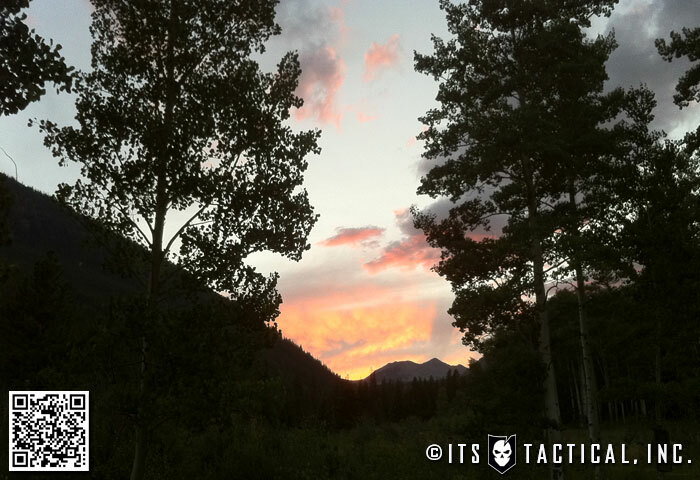 The air was cold and crisp as I got dressed, threw on my pack and walked to the fire pit to wait for the others. Luckily I was able to get a fire going by blowing on the embers still left from our last night at base camp. The warmth was short lived and we departed just as the fire roared to life. We had no idea how far it truly was from our base camp to the summit, but afterwards I found out we put in about 18 miles and a 4,455 ft. elevation gain. Despite the air being cold, we didn’t have the wind of the first summit to Mt. Belford and I was thankful for that. Our climb, while longer, seemed to go faster and follow a more gradual ascent; that is until the last 100 feet that you have to scramble up! 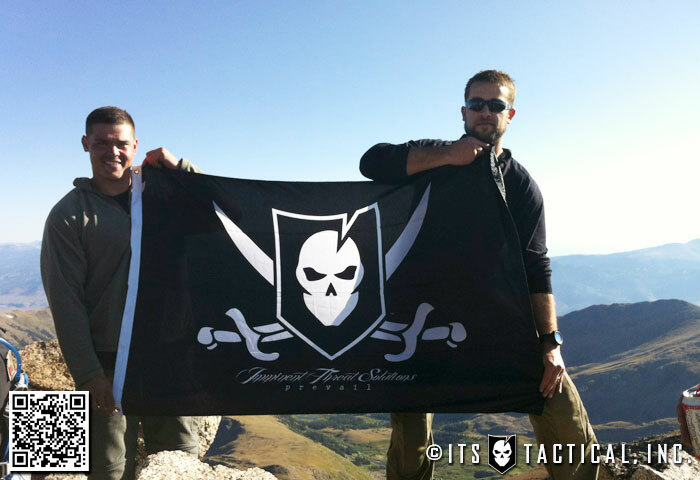 One of our Crew Leaders and active duty Marine, Ben, was with me on the climb up Mt. Harvard and it was awesome to be able to get a photo with him and I holding up the ITS Flag on the fourth tallest point in the contiguous United States! Mt. Whitney is the tallest at 14,505. 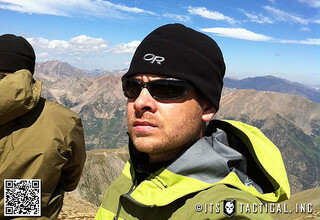 Descending was again a long adventure, but I got the opportunity to talk with GORUCK’s founder and former Green Beret, Jason, for the better part of it. He and I share very similar values in our companies and taking pride in American made craftsmanship. As the teams all convened back at base camp, they were greeted by a delicious stew that the few who stayed behind had put together. 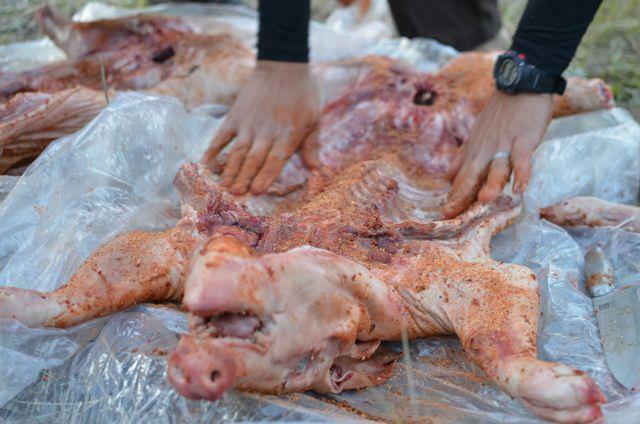 They raided the cadre tents and liberated what they could to ensure we all had a fulfilling meal. Getting back on the bus for the three hour ride back to Ascent HQ was sad in a way. It was like summer camp was about to end. With so many new relationships forged, we rotated between chatting, napping and staring out the window. 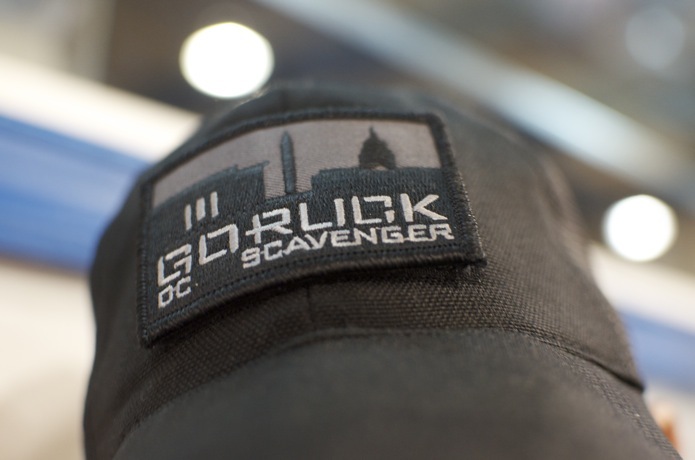 As the bus pulled into HQ, we saw that a fire was going and GORUCK had a surprise waiting for us. Actually two surprises in the form of 45 lb pigs. We could have eaten them raw if given the chance we were so hungry. Once they were seared to perfection, we all just tore in. People were grabbing feet and ears, anything that would rip off easily. We looked like a bunch of savages, using knives to cut off huge chunks of flesh that would have made Al-Qaeda queasy! 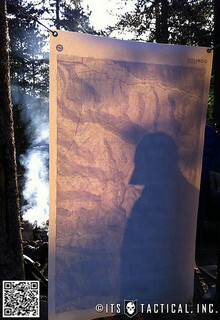 Fat and happy, we hung around the fire recounting the past 100+ hours and were presented with our 2011 GORUCK Ascent patches. We earned it it… We did and did it well. There were also goodbyes to some people were leaving that night. In the morning we packed up and headed into town for some breakfast. We both had a hard time finishing our meals and attribute it to our stomachs shrinking a little. You’d be surprised how much your diet changes when you aren’t guaranteed food. The Ascent was over but we were still ‘hungry.” Not for food but for more of the mountains. We both now have a new goal, to tackle every single 14’er in Colorado. There’s 54 of them and we’re addicted to say the least. The primary take home from this whole adventure was the personal knowledge of knowing that what you think you can’t live without, you can. Lightweight backpacking, minimalism, whatever you decide to call it, it’s the mindset of doing more with less and one that’s hard to come up with on your own. The fact that we were forced, by a scale, to take 23 pounds in a pack that weighed roughly 5 lbs. empty was less than we would have ever taken if left to our own devices. We also tried to game the GORUCK Ascent by thinking it wasn’t going to be a “challenge” like the GORUCK Challenges we’d both been through. It certainly wasn’t a test of our physical abilities, but of our mental capability. What you got out of it is what you put in. Mike: You may think you know what’s going on but you rarely have the big picture. Just take your time and live from moment to moment. Yes, there needs to be planning but don’t get too attached to having regular meals or even sleep. Learn to be flexible. Many things seem impossible but it helps to break them down and focus on the little things. 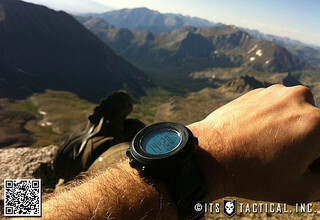 At around 12,000 feet, every single step, no matter how small, was a brand new personal record. Knowing that gave me strength. The mountains are a beautiful arena in which to face challenges that aren’t too easy and success that doesn’t come too quickly. On top of that, you face the challenges with a few carefully chosen friends who have similar goals, aspirations, and work ethics. A great climb is a wonderful mixture of difficulty and intimacy. The challenge is both physical and mental. If your body is willing, your mind can push it to do amazing things. Bryan: Something I’ve never had to deal with is a shortage of food, even throughout my time in the Navy I never experienced that. In Hell Week we were even given 2 MREs four times a day to ensure we had the energy to keep up with the physical demands of BUD/s and being awake for a week straight. 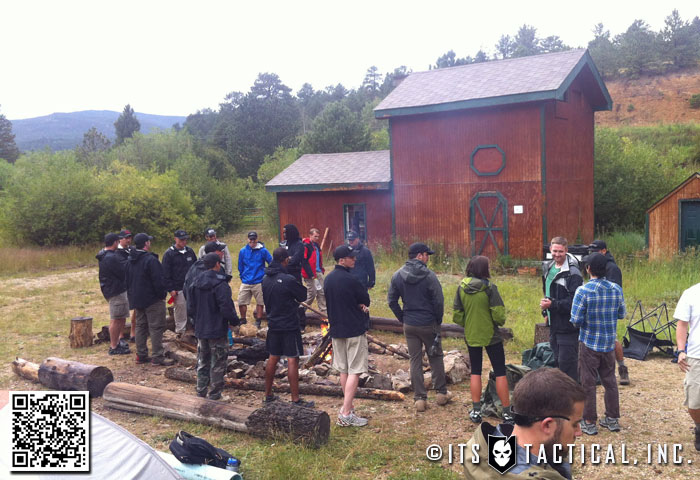 At first I was put off by the fact GORUCK didn’t have food for us, but quickly embraced it and used it as a learning experience. It was also challenging to push through the symptoms of AMS, but now I’ve been there, know what it’s like and what I can truly handle. I say it time and time again in a lot of what I write about here on ITS, but if you’re not putting yourself in situations where you’re overcoming adversity, how can you truly learn about yourself? I’ve learned first hand throughout my life that the mind truly does control the body and that I’m capable of much more than I ever dreamed was possible. 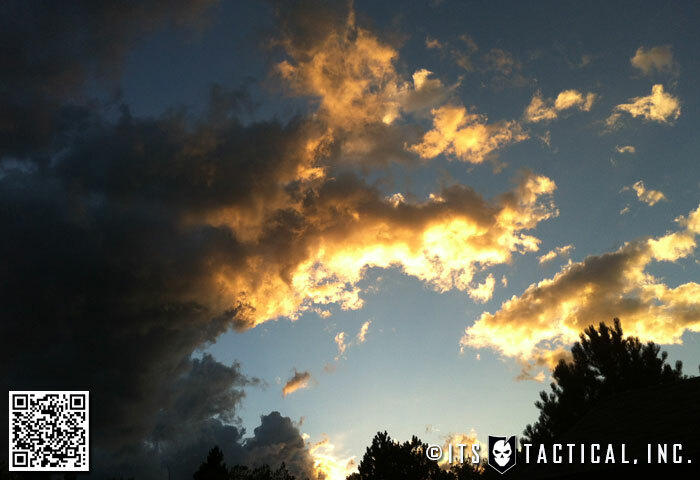 We considered adding in how each piece of gear we took held up, as the GORUCK Ascent was also a test of some great gear provided by awesome sponsors, but we’ve decided to put that in a follow-up post that will be coming soon to ITS. We’re going to get detailed and thought it would be better to devote an entire article to the gear of the GORUCK Ascent. Stay tuned! As mentioned, we couldn’t have done this without our sponsors and everyone who donated to the Green Beret Foundation through our FirstGiving pages. We each needed to raise $1k for the foundation and surpassed it with all the support we had! In the end we raised $4,888, more than doubling our original goal! A huge thank you to Tactical Distributors, Arc’Teryx, Outdoor Research, Under Armor, NEMO, Jetboil, Smart Wool, Princeton Tec and Contour for getting us some great gear to evaluate on the Ascent! We’d especially like to thank Jason, Brian, Lou, Dan, Alex, John, Jack, Rob, Polly, Sarah, Sophie and Java for an event we’ll never forget! Your friendship and camaraderie were what made this event all that it was!